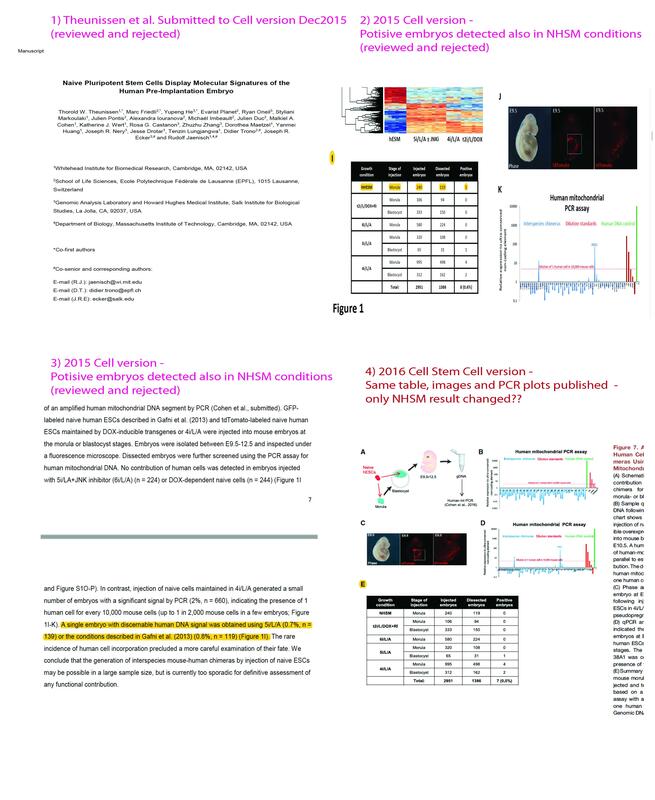 Professor Rudolf Jaenisch of MIT and his former postdoc/now assistant professor at The Weizmann Jacob Hanna have gotten into a very public, stem cell skirmish over conflicting papers. Hanna raised concerns over a Jaenisch lab paper and things have escalated from there. This mess is playing out before our eyes on PubMed (there was a comment from Hanna on the Jaenisch lab paper, but now removed), PubPeer (scroll down near the bottom of the comments on that page for several items), on the website of the journal Cell Stem Cell where Hanna also left a comment, and on Twitter, where Hanna posted an edgy series of tweets (see latest below). Note that the now deleted PubMed comment was nearly the same as the one from Hanna still on PubPeer. Hanna also posted a comment on a Jaenisch PNAS paper from this year and that comment has now been removed as well from PubMed. It’s not every day that you see biologists duking it out in the wide open like this. Well, maybe a stem cell skirmish happens every month or two, but not every day. This one has quickly gotten pretty ugly. The dispute scientifically at least centers on data related to naive stem cells and reports on their ability to contribute to chimeras, which are mice with contributions of added stem cells to tissues. Hanna made specific claims about the Jaenisch lab paper’s results. Jaenisch and his current postdoc Thor Theunissen then responded to Hanna’s statements very intensely back including the above third point mentioning retractions. Also at issue is a copy of an unpublished manuscript. This difficult situation is not likely to get better any time soon and isn’t a positive for the stem cell field to put it mildly. The flammable comments make this feel like it goes beyond just science. It could be a long weekend for those involved. Personally, I am surprised Hanna now switched to the open mode attack. Weizmann Institute must have declared unconditioned support to him, they certainly do not seem to mind data integrity concerns in his papers or in those of his PI colleagues there! @Leonid: You previously wrote a blog post with a “conspiracy theory”, but you absolutely had no proof for the claims you made against Hanna and other scientists. Now, you refer to this post as some kind of factual reference. I find this inappropriate. ahem… the “conspiracy theory” post was clearly marked as satire about Frontiers (not about Hanna, please do not confuse). I am sorry you missed the satirical aspect, it was quite clear for everyone. No, about my having no proof. I invite you to read my article again. You should also be aware that certain supportive information I had I was asked not to publish, by my source (it is indicated in the text though). Forgive me for not believing your claims without seeing any proof. Sounds like a witch-hunt to me and unprofessional writing and reporting. The similarities between Jacob Hanna and Donald Trump are striking. the first imgur link u have does not work for some reason ..